*Dressing will adhere best to cold macaroni. There is much to be said for recipes that have a life of their own. My mom, Donna, made the best macaroni salad. Cooking for her family equals a closed chapter of her life, so I have made an executive decision that the people in my life will - as long as possible - enjoy her incredibly delicious recipe that I have surely mastered by now. If I may, I would love to share a little more about this family recipe of ours. I was very young when my mom first taught me to make this traditional picnic / cold dinner / summer favorite. When my older brother tasted it that first time, he was a little skeptical that it was made by me. He said, “It tastes just like mom’s.” It was the absolutely the highest compliment I could have received. Over the years, my sisters and I have prepared it over and again. Each time it appears on one of our tables, it’s like we’re all home again ... which, as I type these words, actually brings tears to my eyes. This salad seems like a unique link to our past. For me, it just represents an important part of who I am, which is why I love to share it with people I love. When my mom moved from our family home over two years ago, the senior community where she first lived allowed me to entertain the residents with Chef demos. This was one of the recipes I shared and served tastings of, and it was a hit with my mom’s neighbors as well as the staff (one of whom I became dear friends with, that very day). 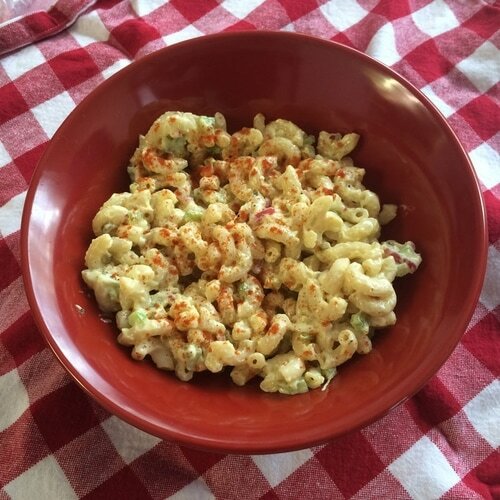 There’s quite possibly magic in this macaroni salad! Well, maybe so, but, according to Google just now, Target has it. Anthony’s brand, $1.59. There are quite possibly hundreds of “classic macaroni salad” recipes out there. One of my mom’s best friends added tuna to hers. As a child, this did not appeal to me. It’s my understanding that a typical midwestern recipe would add bits of cheese (American, most likely), since other midwestern pasta-style dishes add American cheese. This also, does not resonate with me. Finally, while I always order it with my French-dipped sandwich because I just love to, Philippe’s The Original in LA, makes “the most mayonnaise-y macaroni salad” my good friend LuAnn has ever had. Perhaps note that. They use the short-cut salad macaroni, by the way. This brings me to my recipe and, the sudden realization that a few weeks ago I published a Mac-and-Cheese recipe so now it appears as though I always have macaroni on the brain. Well, that is not entirely true and, you can always substitute cubed cooked potatoes for the macaroni if you’d like. Then you will have Donna’s Potato Salad recipe.